Bonjour lecteurs! We have been really quiet lately as we were off for a few days. After our mini holiday in the Cotswolds, we are now back in London and to make things even better, we have a new giveaway on the blog for you! Oui! Our Sophie La Girafe Baby Skincare Review will give you the chance to win a gorgeous Sophie La Girafe Baby Body Lotion and Hair & Body Wash Set worth £26.99. I am so happy to be back and present you with a cute Frenchie brand! We have always been huge fans of Sophie La Girafe! Baba has so many toys with le fameux animal. We love it so much indeed that Baba had 3 giraffes. Oui, you are not dreaming. I bought him one and we also got the other two as a present. We were also lucky to review a puzzle some months ago and it’s juste adorable! So I was very excited about receiving some skincare products with the fab Frenchie brand! 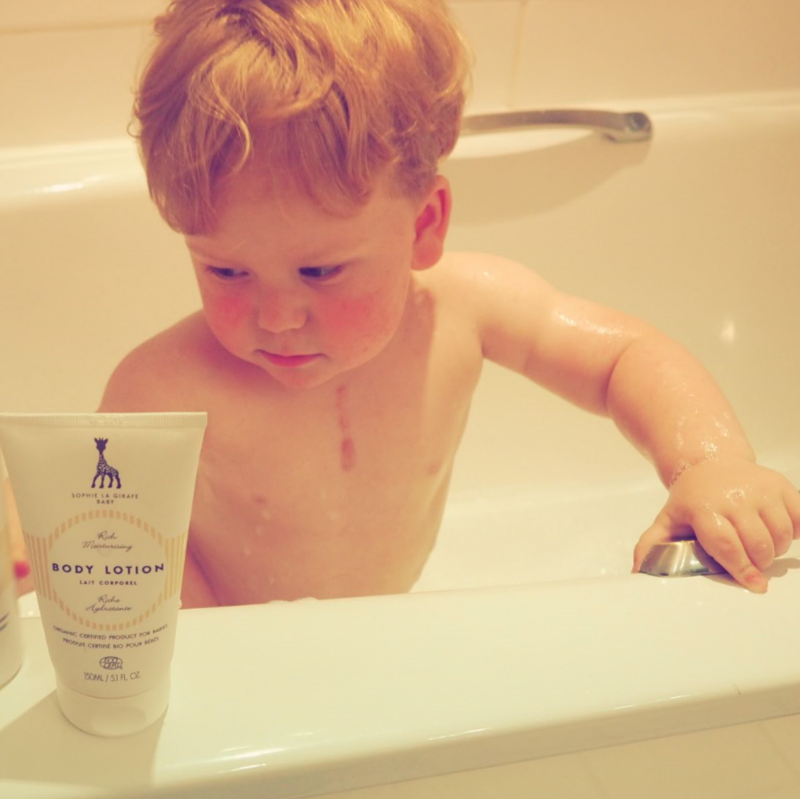 On the market since 2014, the range of Organic Baby Skincare products from Sophie La Girafe offers a great variety of products including body lotion, hair and bodywash, bubble bath, baby oil, protection cream and face cream. You have so much choice! In order to write this review, we received 1 Sophie La Girafe Baby Body Lotion and Hair & Body Wash Set worth £26.99. 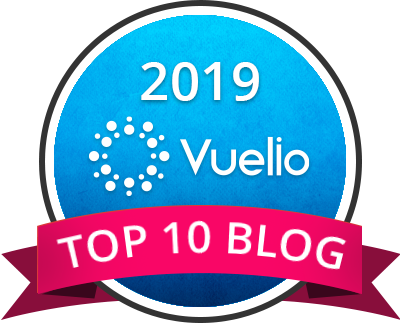 Don’t forget that you can also win one at the end of this post! There will be only one winner! The first item in the set is a nurturing, gentle cleanser for your little one’s skin and hair. I like the fact that it does both les cheveux et la peau. It means that when you get away, you only have to pack up one product. 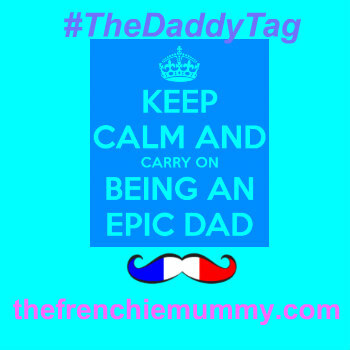 I am already famous for being unable to travel light, so we can’t really afford Baba to be a diva too… There is only one space for this title in the Frenchie house! Made of white tea that protects the skin during the washing, the body wash has a great texture. We loved having a lot of foam in the bath! The lavender water and oat milk also provide a gentle cleansing for sensitive skins. This product was by far our favourite! This lotion is rich and moisturising. I personally tried it as well before Baba had a go and it really nourished my skin. I always try products first to see if I have any reaction. And it passed the test! Made of jojoba oil, cocoa butter and shea butter, it makes your baby’s skin soft and nice. I like that fact that the ingredients are so natural. Baba’s skin was soft but the smell was maybe a bit too strong in my opinion. I usually like using lighter fragrance on mon bébé. With a 150ml tube, it will surely last us long. Overall, I really like this Frenchie set. It feels luxurious and Baba’s skin is very soft. The packaging is subtle and would match any bathroom. I know it might be silly to think about that but if you really want to be a fashionista, then it’s a plus point! 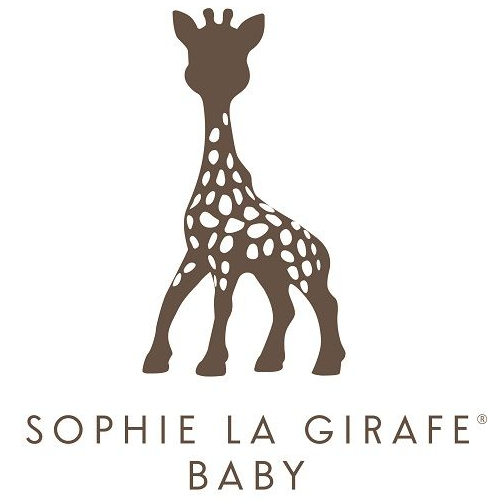 The Sophie La Girafe Baby Skincare is a must-have for any fan of the brand. Even if it can seem a bit pricey compared to other similar products, it is worth it. This kind of set actually represents a beautiful gift. We really like the Sophie La Girafe Baby Skincare. The products we tried contain high-quality organic ingredients suitable for babies with sensitive skin and have been subjected to full dermatological testing to guarantee their safety. Plus the ethical manufacturing process is a great feature too! Why not help others while treating yourself to something? Do you love Sophie La Girafe? Would you like to try this bath set too? Do you know a beautiful baby out there who would love to receive such a beautiful present? Then, enter our fab GIVEAWAY now to win 1 Sophie La Girafe Baby Body Lotion and Hair & Body Wash Set worth £26.99. Win this fabulous prize with us today! This giveaway starts on Wednesday 23rd August at 5 pm and ends at midnight on the 23rd September. The closing date is 11:59 pm on the 23rd September. Provision of the prize is the responsibility of Sophie La Girafe Cosmetics. Disclosure: we received this set for free in exchange for an honest opinion. My favourite is the classic Sophie Teething Giraffe. It’s been a constant companion for my little one! I love the Sophie the Giraffe So Pure Trio Set! Sophie the Giraffe teether was a life saver! I like the teething giraffe! My favourite is the classic Sophie Teething Giraffe. The Giraffe So Pure Trio Set! I love the Teething Giraffe! I LOVE the little giraffe teether toys, they’re adorable. Although the bath sets look great too! The Sophie the Giraffe So Pure Trio Set! We love the original teeth toy Sophie! Sophie la girafe bath puzzle. I adore the classic teether giraffe. 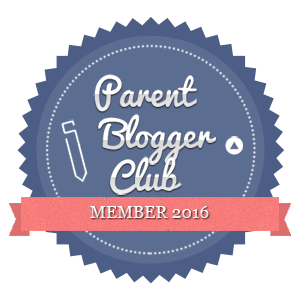 Definitely the classic Teething Giraffe for me – it’s fab! I adore the Sophie Teething Giraffe, so cute! The Paris Magic Lantern, so pretty! The classic Sophie Teething Giraffe has had a lot of use in our house! The I Love Sophie Set looks perfect with it’s little heart rattle and Sophie Giraffe. My favourite is the Classic Sophie Teething Giraffe ? Classic Sophie Giraffe for Teething Toy. I love the look of the the Comforter Gift Set! Got to be the original Sophie! The original toy is a classic! I love the classic Sophie La Giraffe toy – nothing better in my experience! Sophie la Giraffe teething ring! My granddaughter loves chewing her Sophie giraffe toy. I like the body lotion, smells delicious! 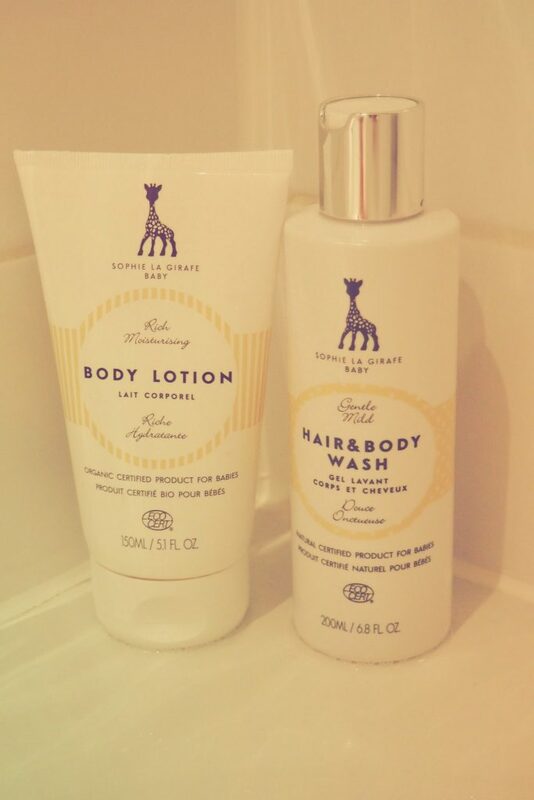 Sophie La Girafe Baby Hair and Body Wash 200ml is a great all rounder. I like the Sophie la girafe Star Projector. I love the original Sophie la giraffe. The body lotion! Although it all sounds absolutely lovely! I love the Sophie la girafe Bath Puzzle. My daughter would adore this. Sophie la girafe Hooded Bath Towel (Gift box) is cute! It has to be the Sophie Teething Giraffe – only ever heard good things and my god daughter loves hers! I like the look of the Sophie la girafe Rainbow Colours sticker book. The teething giraffe is too cute!! Sophie the giraffe teether has been so good! I like Sophie giraffe teether! The original Sophie, both my boys had one and my new baby will have one too! We love the original Sophie teether, she’s awesome! 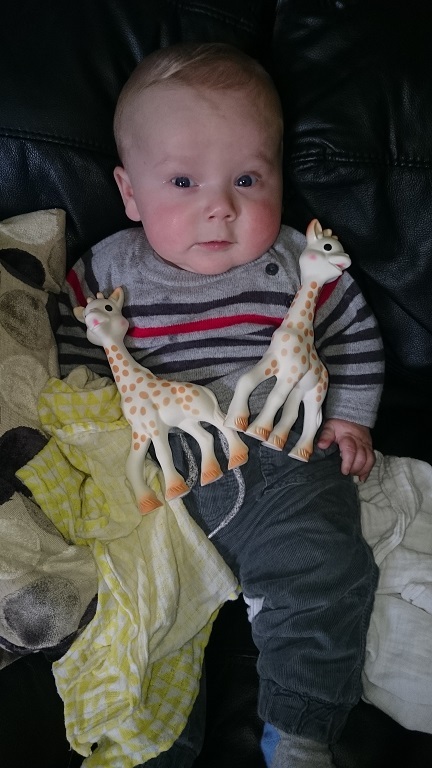 I loved the Sophie The Giraffe Baby Original Giraffe Teether for my boys now looking at getting one for my new grandson who is due soon.